Along the coast and westward to Minn. Flowers: large; terminal; nodding and subtended by a leaf-like bract. The lip forms a drooping sac an inch and a quarter broad. It appears to be split down the middle, but is nearly closed; much veined with a darker shade of pink. The sepals and petals vary from green to purple. Leaves: two at the base; sheathing the leafless flower-stalk; ovate; many-veined. Root stock: thick. 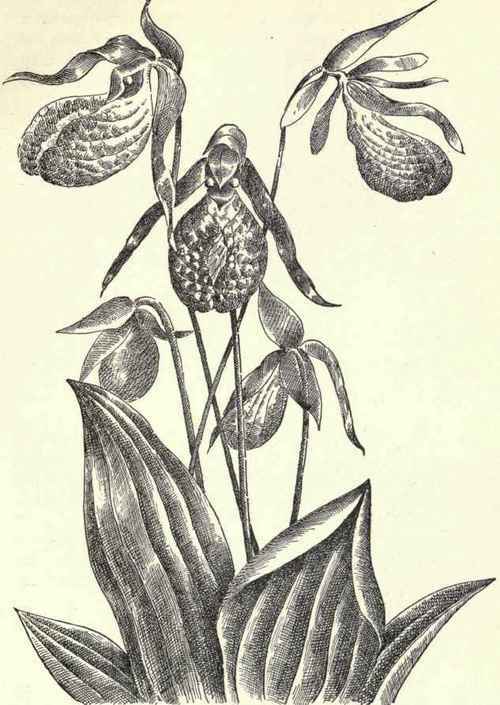 The pink lady's slipper shows very plainly its kinship to the pampered darlings of the conservatory. 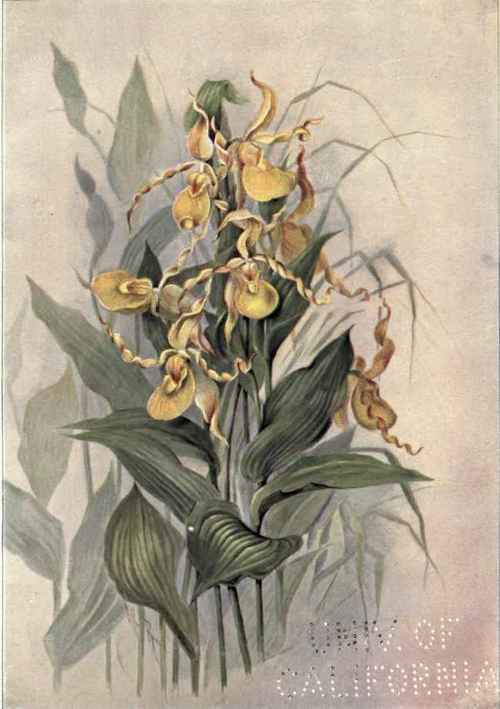 It is a more languid beauty than the yellow species and we may fancy of a more sensitive and retiring disposition. It is shy of approaching the haunts of men but rather hides in the seclusion of some deep wood or forest, where its loveliness is seen by the croning bee and the soughing wind only. As the lip resembles a moccasin much more than a slipper, it would seem that while we claim the yellow one for our own, we should resign this orchis to the people that have loved it so well. Like the Indian, it is becoming rarer every year, and unless we respect its love of freedom and cease from carelessly picking it, we shall soon find that like him it has vanished from us forever.